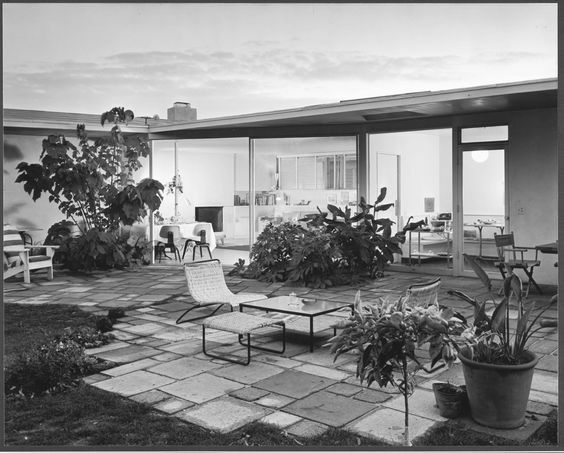 So you’ve found your modernist dream home, been the succesful bidder (defeating all who planned on demolition) and have moved in with your amazing array of funky MCM furniture. 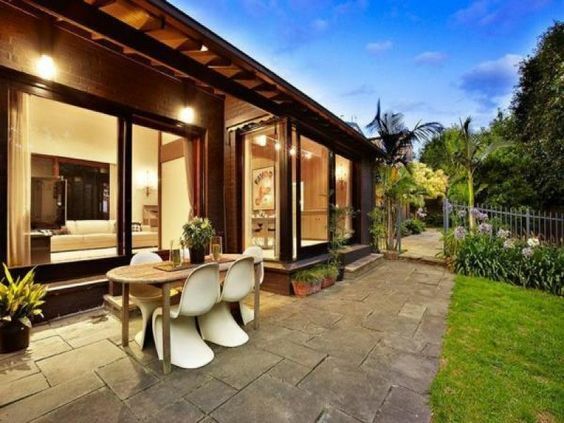 Outdoor entertaining is a part of Australian suburban life and has been for decades. 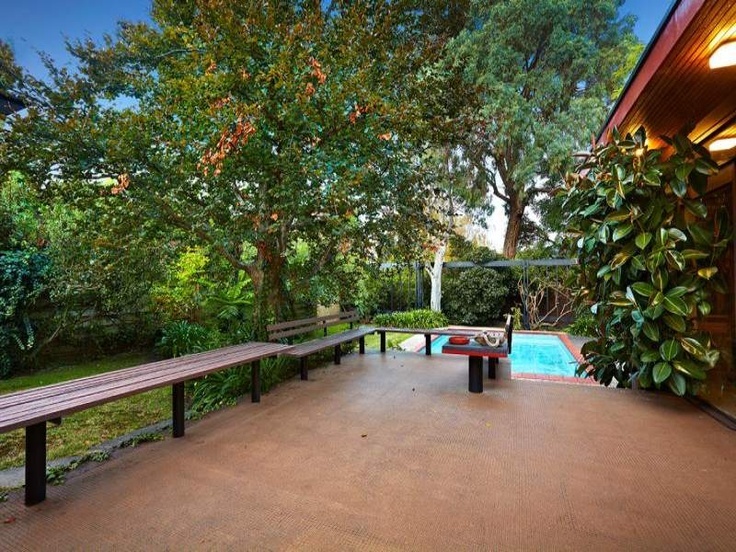 While Melbourne weather is sometimes cruel in this respect, you still can’t beat a relaxing afternoon or evening spent in your court / back / front yard with your family and friends. 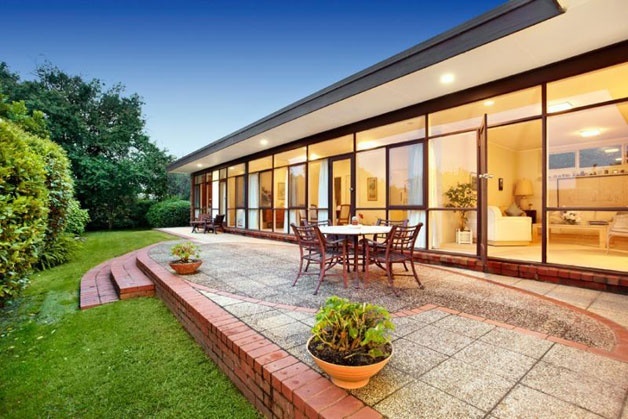 Today I present to you 10 great ideas for paving your terrace or coutyard. Be it bluestone, sandstone, slate or limestone, natural stone looks great and can work really well in complementing any natural timber or stonework in your home. The examples above and below show randomly laid slate pavers, the commonly referred to ‘Crazy Paving’. As you can see, this paving style works in both a formal setting with solid walls and straight borders, or in a more natural setting where the pavers bleed out into mulched garden beds. Due to the thin nature of this paving material, slate should be laid on a mortar bed for stability. 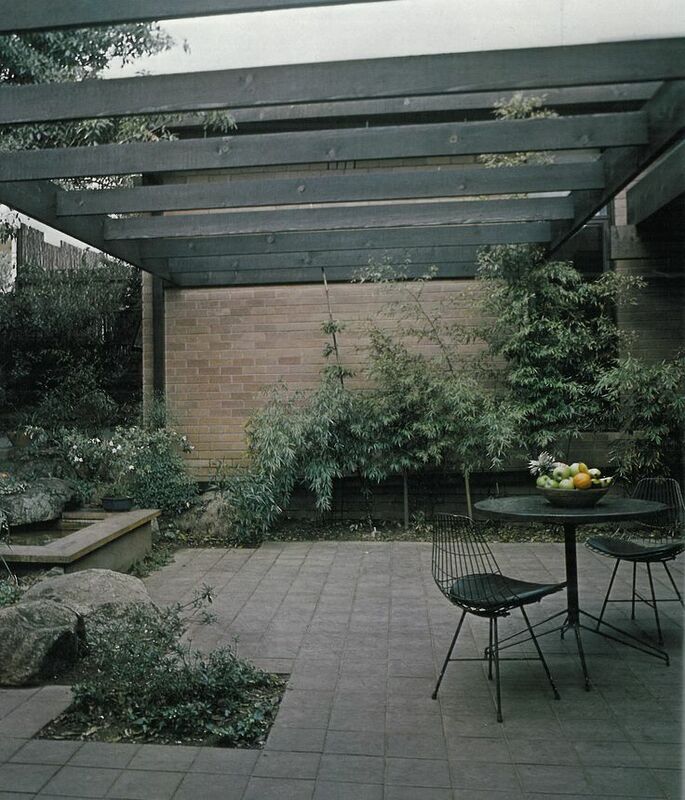 Bluestone has always been a popular material in Melbourne and its square blocks can be used for more formal paving arrangements such as in the courtyard below. 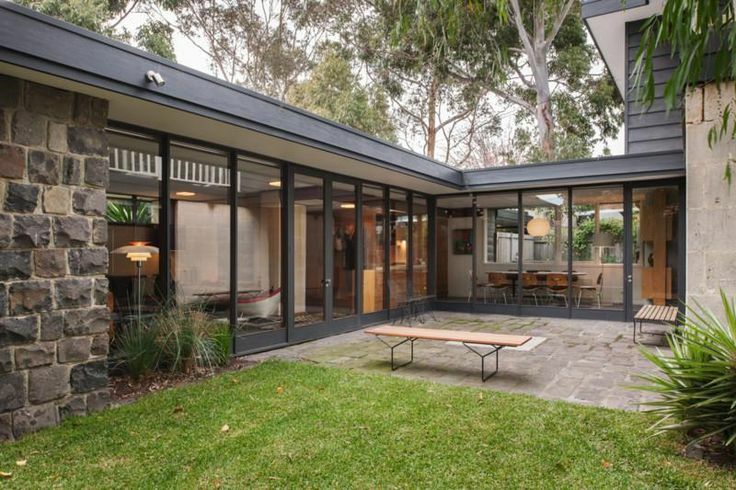 Once again, the paving complements the materials in the facade of the home. 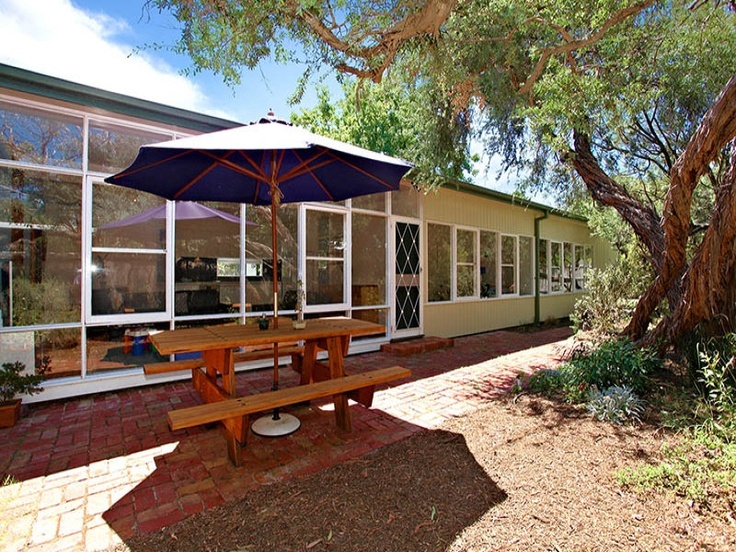 A thicker stone block such as bluestone can be laid as a ‘Flexible Pavement’ on a bed of sand which is a less expensive technique and provides a surface that can allow a small amount of permeation of rain water through to the soil. In contrast, laying pavers in a ‘Rigid Pavement’ (on a mortar bed and concrete base) generally achieves a more accurate and formalised finish. This pavement is solid and impervious however, and requires consideration of how water will drain from the surface. Natural stone pavers come in a variety of colours, shapes and sizes and while often more expensive than other paving styles, they provide a timeless finish. Being a natural product, stone pavers are quite porous and should be sealed to prevent permanent staining or discoloration from everyday use (or from red wine spills during last night’s sophisticated dinner party). The humble house brick works just as well as a paving material and sourcing recycled bricks is a cost effective way to pave your outdoor areas. 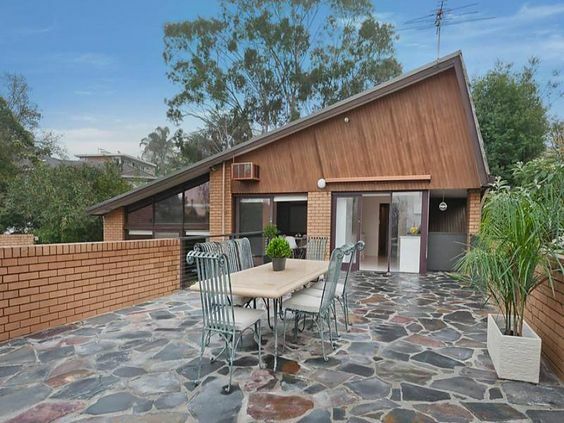 Bricks can be laid in a number of patterns and work well in both formal or more rustic surroundings. As with stone paving, bricks can be laid on either a bed of sand or mortar. Pre-cast clay or concrete pavers are available in a large range of colours, shapes, sizes and quality. Generally they are less expensive than natural stone, however some top of range pavers can be similarly priced. As seen above, smaller square pavers work well in courtyard environments and can be laid to allow for planting bed cut-outs. 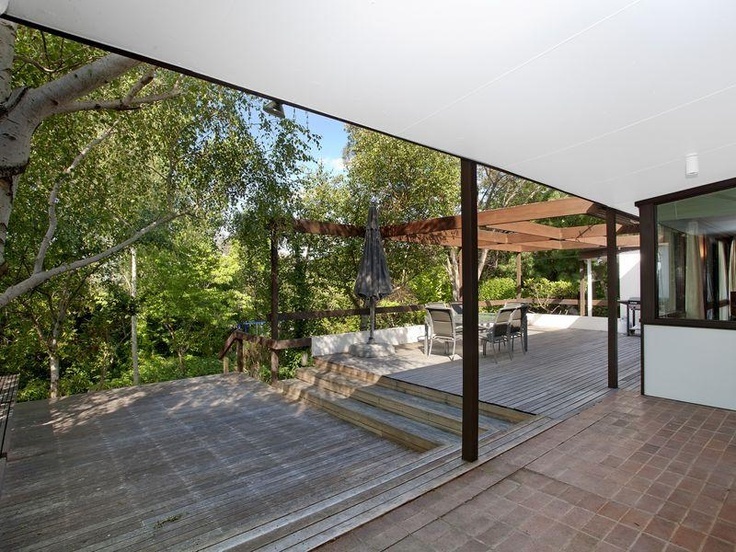 Natural colour schemes complement timber features such as the retaining wall and pergola. The variety of shapes and sizes in pre-cast pavers allows for some creative paving designs to match different styles, as seen above and below. Once again, either a rigid or flexible pavement construction can be used depending on the desired finish and style of the garden. A fantastic looking form of the pre-cast paver is polished pebble crete. This material is great for formal terraces and can be combined with brick walls and edging as shown below. As a formal pavement, they should be laid on a mortar bed for a solid, accurate finish. The dominant colour of these pavers is the off-white of the cement with highlights provided by the mix of pebbles, usually black and grey. The smooth polished surface is a great complement to homes where white is the dominant colour in the scheme. 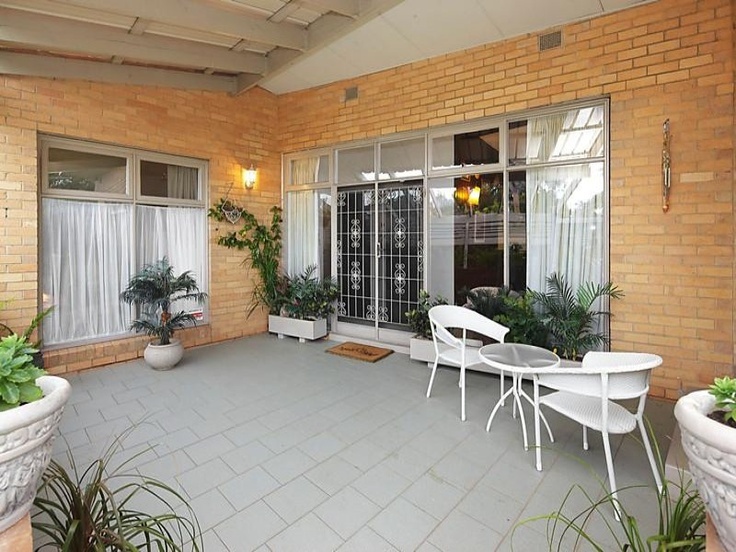 A formal terrace or courtyard can also be achieved with tiles. These are available in many different colours, shapes and sizes and can even match tiled areas inside the home. 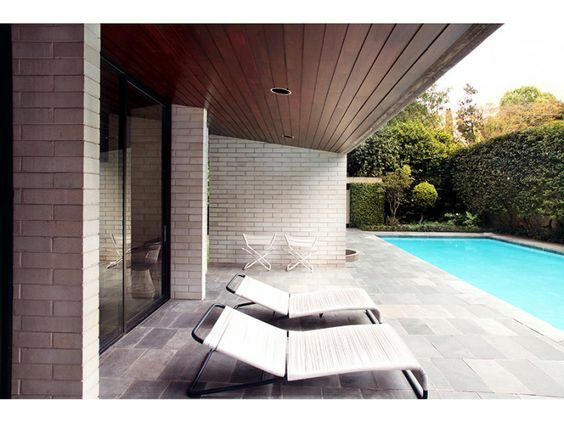 External tiles are laid in the same way as indoors, on a solid concrete base and mortar bed. 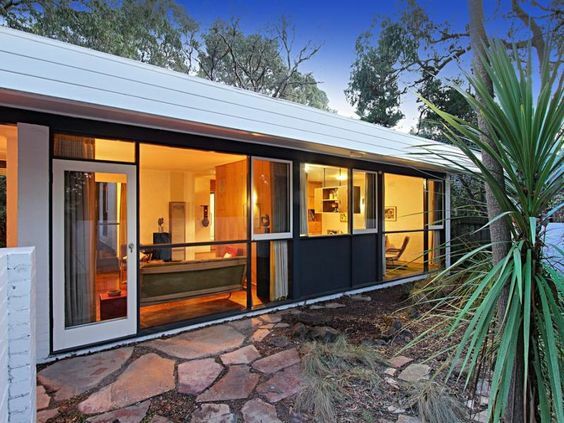 It is important to select a tile that is suitable for external use. Details to consider are texture for a non-slip surface and whether the tile is pre-sealed to reduce maintenance. 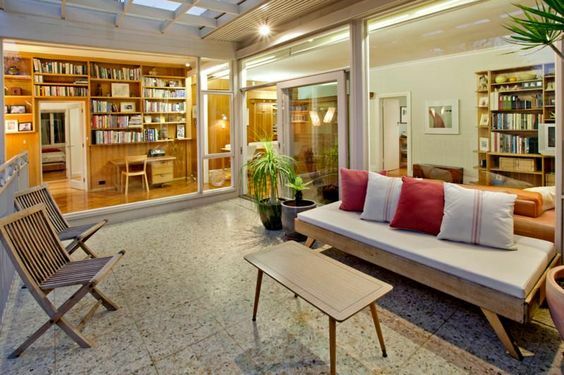 Concrete is another reliable surface and can be installed in a variety of ways. The pavement in poured in-situ (on site) over a prepared base of crushed rock, a network of steel reinforcement bars and against removable timber formwork. 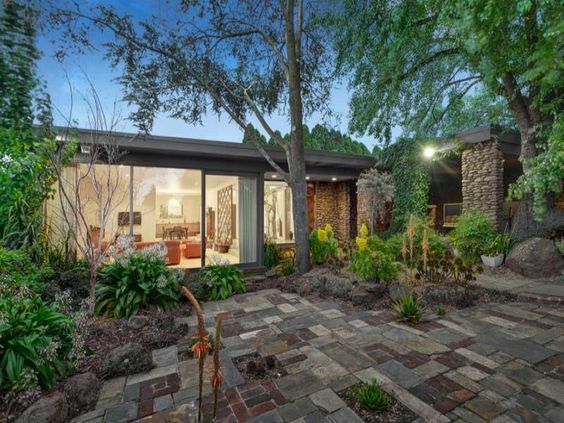 The garden terrace that was so popular in the recent auction of Dr Fooks home in Caulfield, is a great example of a coloured and textured concrete. The colour can be either applied as a paint to the finished pavement or mixed through the wet concrete mix before it is poured. An exposed aggregate or pebble-crete finish can be achieved by using a selected colour pebble or stone in the mix and then washing the top layer of cement off the pavement during the drying stage. 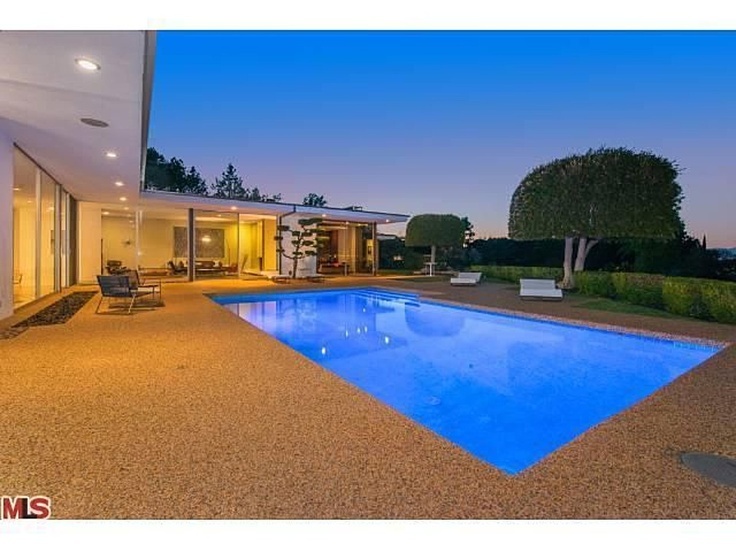 This pavement style is great for driveways and has always been popular around MCM swimming pools! Used in combination with other pavers, or as a stand alone surface, loose pebbles or rock provide a different style of ‘pavement’. Loose pebbles generally create a less formal setting, however their use in traditional Japanese gardens would suggest that they can work in any setting! 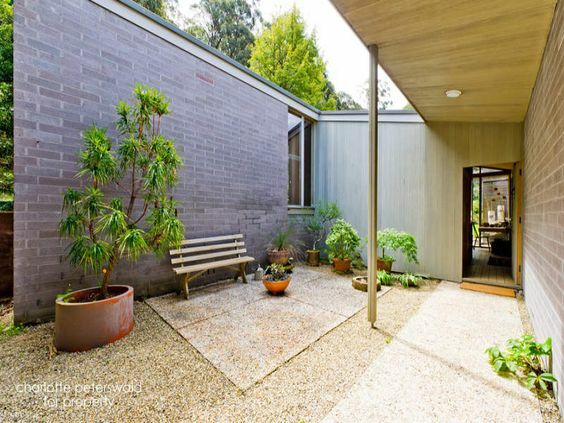 Paths and surfaces around the home can be made of crushed rock (such as ‘Lilydale Toppings’) or even coloured scoria as seen in Harry Seidler’s Gissing House below. Pebbles can be laid loose or even set in mortar as a border to other paving materials. The example below shows pebbles laid in a variety of techniques in the one paved area. 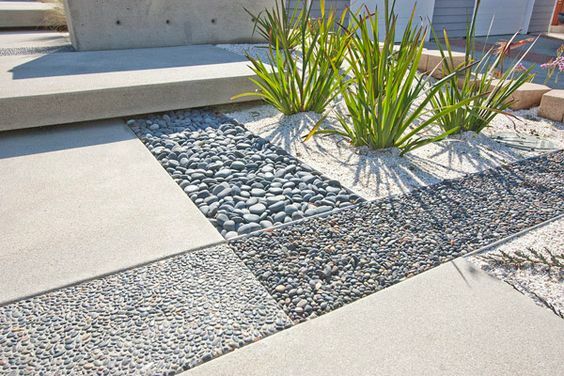 Similar to the example above, any of these paving materials can be used in combinations to achieve a great garden space that complements the built form of the home. 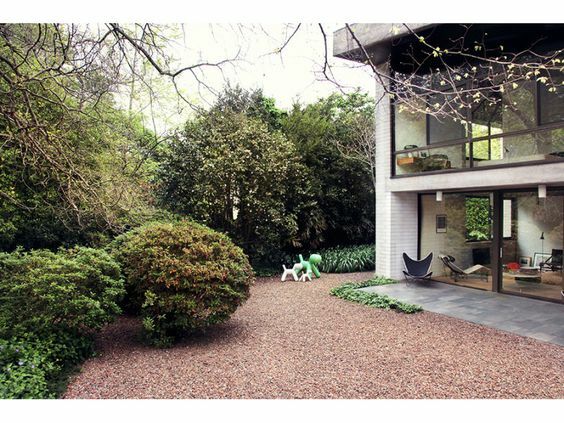 In this example bricks and natural stone are laid randomly to create an informal pavement that combines well with feature garden rocks and the stonework of the house. While not technically a paving style, timber decking is a suitable surface for an outdoor entertaining area, especially where site fall provides a design challenge! Multiple levels and steps can be constructed, although the structure required for a deck can make it one of the more expensive options for your outdoor terrace. 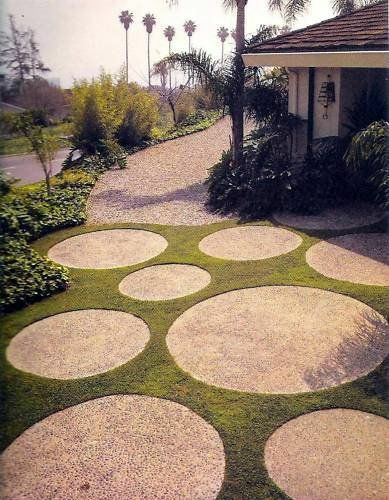 If you are after something a little bit different then why not get some round concrete pavers set in your lawn?! They can be pre-cast or poured in-situ for complete flexibility in their shape and size! So there you have it. All that is holding you back is your imagination (or maybe project budget…..)! Love all the idea’s – which one to pick??? I have to say I love the large rounds…. They are hard to go past, aren’t they! I think my personal favorite is the random slate. There is a lot of effort in the installation but the finished result looks great! I must confess I have loved crazy paving all my life and I’m sure I could have both.